Large, lovely, modern and colorful apartment with fantastic ambience right in the middle of a shopping street. The apartment is about 150 sq.m. + Close to the driverless Metro train --- and everything else. You can walk from here to The Royal Theater, Amalienborg Castle, Nyhavn and Strøget. This location is the entrance to all of Copenhagen. If you want to experience Copenhagen and walk around the downtown area, this is the perfect place. Large fantastic apartment in the middle of downtown. You won't find anything much better. Hall, large combined kitchen / dining room / living room, 1 bedroom with 2 single beds on the street side, 1 master bedroom on the side of a very large fantastic back yard that's almost like a park in the middle of the city. 1 guest toilet and 1 combined toilet / bathroom with shower. WiFi, TV med some international channels, a little stereo and a dishwasher. Washing facilities for clothes in the building (extra costs to be paid on the spot). Appartement well situated, very pleasant and cosy. We would have know the owners ! Thé welcome was impersonal and quick. You need to know that the majority of the windows open out to a pedestrian street. In the morning, the street cleaners and garbage trucks are out in force (starting at 6am). There are numerous people walking, talking and yelling up to 3am which makes it difficult to sleep with the windows open. The apartment itself is located in a fabulous area. It is close to EVERYTHING. It is very clean. There is a playground in the garden of the building. People that live here enjoy it eating and having relaxing moments . 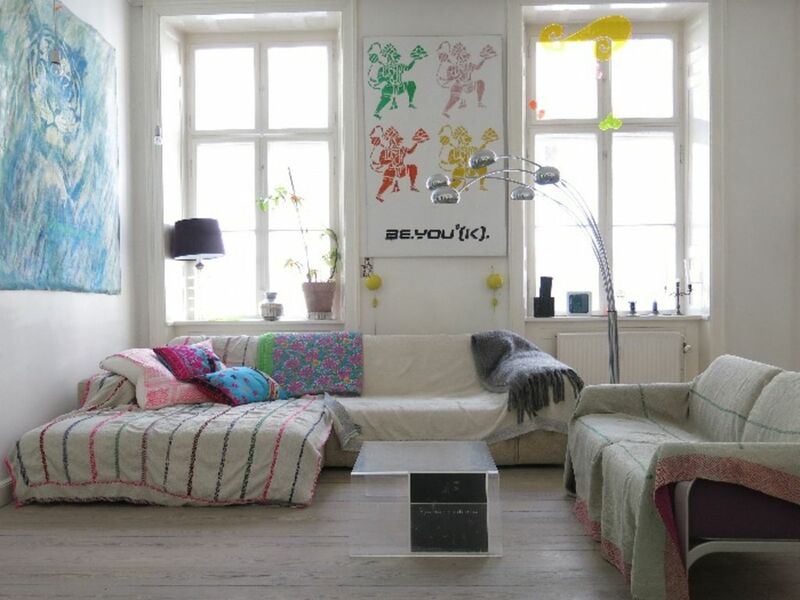 Very Big apartment, very nice furniture and atmosphere. Located close to all major services and metro/train stations. only negative note: no curtains, neither in the bedroom, light come in very early in the morning, and sometimes the street is a little noisy, even at early hours.